Where are all the great new horror books? Horror used to have its own burgeoning section in major bookstores — now it's been pushed to the sidelines. 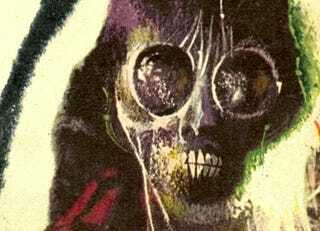 Blogger Michael Ferrante wonders where all the great horror fiction has gone. Last year, when doing my October month of horror fiction (and likely at least once before that) I've mentioned the difficulty I've had in finding and locating new and interesting horror fiction. While my reading has been slow this month I struggled again this year in trying to track down horror fiction to read. In the course of my brief and hardly comprehensive search for new fiction of the supernatural and macabre I've still struggled to find titles. Before I started working in one I used to love visiting a local bookstore and browsing the shelves for serendipitous finds to catch my fancy. But, even long before the retail world curtailed my zeal for browsing the division of fiction by genre had ceased to include Horror as an option (the last time I checked Borders still had sections for both Horror and Westerns, they were crammed adjacent to one another and constantly shrinking but still there; I don't know if that is still the case). Science Fiction, Fantasy, Mystery and Romance all have their own section in most bookstores but poor Horror has been lost to the wayside. A quick browse over to Amazon will note that their books page includes most genres except horror; horror can only be found by clicking on "Browse Subjects" (or by going to Literature and Fiction and clicking on Genre Fiction). Even then a quick browse of recent titles reveals a weird mix of fiction that doesn't seem to be too closely related to horror fiction at all and some that does. Book Depository does slightly better, lumping horror in with science fiction and fantasy, but the predominance of authors like J.R. Ward and Sherilyn Kenyon indicates a distinct gap between what I think of as horror and what I assume the general reading public is looking for. Of course there is always the Horror Writers Association purveyor of the fine Bram Stoker awards whose winner and nomination list will most definitely provide some fascinating and noteworthy titles. But many titles aren't the type of horror I'm looking for. For example 2009 First Novel winner Damnable by Harry Schwaeble and 2009 Best Novel nominee Patient Zero by Jonathan Maberry look to fall squarely into the "action-horror" blend that, while certainly entertaining, isn't the type of horror I'm really looking for. I am, and will always be, looking for what Lovecraft referred to as "a literature of cosmic fear" in which, as he also states: "A certain atmosphere of breathless and unexplainable dread of outer, unknown forces must be present; and there must be a hint, expressed with a seriousness and portentousness becoming its subject, of that most terrible conception of the human brain - a malign and particular suspension or defeat of those fixed laws of Nature which are our only safeguard against the assaults of chaos and the daemons of unplumbed space." In recent years there is also a considerable volume of zombie fiction that overshadows some subtler works in the genre and, while I'm not opposed to works featuring the walking dead, the majority of zombie novels have frequently failed to excite any fear and dread. Many titles on the Stoker lists are small press titles and are frequently only available directly from the publisher. This isn't exactly a bad thing, particularly for someone like me (I wouldn't call myself an "average" consumer), but when it comes to horror turning to the small press has it's own unique problems. Much like Subterranean Press many of the publishers who specialize in horror do so as a sort of "boutique" publishers offering deluxe, signed and premium editions of titles. Some, though not all, seem to be available only as these deluxe editions. To be fair, my primary exposure to this is via Horror Mall so if there are other specialty retailers that deal with more common trade and hardcover editions I don't know. As I said some of the titles from retailers like Horror Mall are still available in standard editions, particularly when it comes to reprints of established authors, but there seems to be a tendency for newer authors, and authors more well known amongst horror aficionados, to be offered only in limited or deluxe print runs at prices around $40. Again, I admit I could be missing something, I'm just not sure. As mentioned above given that many bookstores lump works of horror and supernatural fiction in with their general fiction there are still titles with horror themes released by more well known publishers. For example The Caretaker of Lorne Field by David Zelsterman was put out by Overlook Press this year, and Thomas Dunne released The House of Lost Souls by Francis Cotton last year alongside their imprint St. Martin's reprint of David Wong's John Dies at the End. Leisure Books (a Dorchester imprint) prints Richard Laymon, Nate Kenyon and Brian Keene titles in mass market on a fairly regular basis while Brian Lumley is still with Tor. Caitlin Kiernan is still in print and 2010′s The Red Tree may be her best book, and while Cherie Priest may have moved on to steampunk, her southern gothic Four and Twenty Blackbirds was reprinted in 2005 by Tor. I know that's a bare handful of titles, but those were just the ones off the top of my head and who knows what other horror titles might be buried in the mountainous pile of "general fiction." While I'm pretty tied in to the Sci-fi/Fantasy blogging scene, and have uncovered a fair number of blogs about mystery and detective fiction, I have yet to discover any similar communities surrounding horror fiction. While publications like Fangoria and Rue Morgue still seem to have an audience both magazines continue to focus on film and the same can be said for fan sites like Fatally Yours. Indeed the only site I managed to dig up is the typically excellent Horror World, whose quick to-the-point reviews are well worth a look. I guess the main point of this endless griping is the difficulty that the average reader, should they ever really want to read horror, will have if they decide to look for a new title. As a librarian, it is distressing that a genre is so deeply buried as to be frequently difficult to acquire new titles. This post by Michael Ferrante originally appeared over at his blog, King of the Nerds.